So says the unnamed narrator of this intriguing new book from one of my favourite authors, Adrian Mitchell. And she should know, because she and her irascible husband lived alone for decades on Dunk Island at the turn of the twentieth century while he wrote his Confessions of a Beachcomber (1908). Well, not quite. I have misled you. I blame the author because he has done such a convincing job of creating the unheard voice of Edmund James Banfield’s wife, Bertha Golding. The real Edmund Banfield did exist, he was originally a newspaperman and you can read about him at Wikipedia. And he did decamp to Dunk Island after he was diagnosed with TB and a nervous breakdown. He leased the then ‘uninhabited’ island for 30 years, had a plantation there and made a living by writing newspaper columns. Of course Dunk Island was not uninhabited, it was the home of the Bandjin and Djiru people, and indeed the WP entry for Dunk Island tells me that Banfield’s writing described the customs and legends of the people who lived there. The curious thing, as Adrian Mitchell discovered, is that Banfield in his writings said almost nothing about his wife and sole companion on the island. Well, the author has given her a voice. Drawing on Banfield’s writings he has fictionalised a life, making it clear that it’s fiction by giving Banfield the new name of Edward, and drawing attention to Banfield’s shameful failure to acknowledge her by leaving his narrator un-named. The novella is artfully constructed. 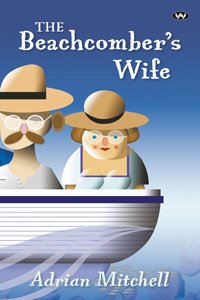 The reader begins to have questions almost right from the start, but the narrator’s thoughts drift as she waits for help from the mainland after Edward has died so the answers come in their own good time as she looks back over her life: her courtship; her husband’s perilous health; their early years on the island; their survival of a cyclone and so on. It becomes obvious that this isolated life was no idyll, but that there were marital differences of no small consequence. Now that he is dead, she feels that she might be able to read ‘his’ books. Imagine that! So much for the wedding vow that ‘with all my worldly goods I thee endow’! What I found was that I seemed to be living more and more inside a kind of envelope, the equivalent in sound of a darkening room. My friends were all very caring and concerned. They took to looking right into my face, and exaggerated their enunciation; much as we used to do in the church choir. The question that becomes urgent in the reader’s mind is what will she do, now that he has died? They had a rigid separation of gendered roles: she cooked, cleaned, sewed and looked after the chickens and the cow, while he planted, pruned, caught birds and fish for the table and although not a natural handyman attended to building repairs (permitting her to assist when he needed it!) He also brought in their small income, and indeed it was partly her inability to fend for herself on the mainland that kept her stranded on the island with him and forged her uneasy accommodation to it. Those essays, these books. It hurts that I am not mentioned, in twenty-five years of his beachcombing. Twice, I think, there is a roundabout acknowledgement that he had a life companion, meaning me, though I cannot think what is so difficult about saying he had a wife. Just once he managed to set that down in so many words, in a dedication, which pleased me very much. But a reader would be hard put to it to find anything more than that; indeed one has to go looking for that particular page. Nothing of the companionable walking along the beach together. nothing of the plants I brought to his attention, nor the birds frisking in among the bushes on his blind side. You can read Confessions of a Beachcomber as an eBook from the University of Adelaide. Speaking for myself, I’m pleased that Adrian Mitchell has waded through its pomposity to give us this intriguing novella instead. PS That whimsical cover art is a detail from ‘Another Coral Sea’ by Jim Olsson. My father gave me The Confessions of a Beachcomber for xmas 2008 – reissued by the Five Mile Press ‘Australian Classic Edition’ in 2006. I found it more than a bit slow and never got past the first few pages. the Introduction by Lucy Hopkins whose great grandfather was Banfield’s friend and providore includes the para. “The Banfields themselves are fondly remembered in Hopkins history. Bertha banfield’s deafness was of particular interest for the curious younger Hopkins children. My great-aunt Margaret remembers Bertha Banfield placing her [hearing aid] on the piano so she could hear Margaret’s playing. After Bertha’s death, Spenser [Hopkins] and his children returned her ashes to Dunk to be buried beside the body of her husband. It is a book I will read for am interested in deafness because it’s very close to home with an elderly father almost totally deaf. Not only the social isolation for the individual but the family conflicts that can and do arise. Oh, I would sincerely hope that things are better now than they were a hundred years or so ago. Just last weekend we were having coffee in Brighton when my MIL (90+ years old) noticed a couple engaged in a lot of hand-flourishing. She didn’t recognise it as Auslan. Like many people these days I know the alphabet, though not complete words, but I could (and have had) brief conversations of sorts with deaf people, and if I knew any socially I could take myself off to a CAE or a TAFE and learn to sign. Of course it’s a different thing when people become deaf in old age and are too old to learn to sign. *chuckle* And also when they learn to use selective deafness as a strategy! Yes, because it takes patience and respect to communicate with deaf people – and not everyone has enough of both. I came across Banfield through Dorothy Cottrell who had polio & spent her life in a wheelchair, but that didn’t stop her from doing a ‘bunk to Dunk’ ie eloping there with her uncle’s bookkeeper! She’d been obsessed with ‘Confessions’ & Dunk Island since her mother gave her the book as a girl. The Cottrells were there when Banfield died & Bertha thought they were involved with his death & there was so much misunderstanding & acrimony that they had to leave in a hurry. Cottrell writes about the reef in ‘The Singing Gold’ which I think is a beaut book (but alas way out of print). Mitchell’s book sounds great & I’ve added it to my TBR list. Hi Jessica, great to hear from you and happy new year! Wow, what a story, what a pity The Singing Gold is out of print! Might it be available on Project Gutenberg Australia, do you think? Hi Lisa, Happy New Year to you too! Alas it doesn’t seem to be on Gutenberg Oz – I had to sit in the John Oxley library in Brissie to read it – I was writing an essay on Cottrell, & hope to do a book on her too. With any luck Text might be interested in republishing! I really enjoyed your review of The Dyehouse & have heard many others say good things about it too so have added that to the list as well.